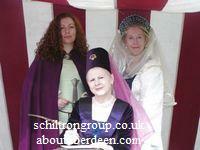 Historical re-enactment groups throughout Aberdeenshire re-enact a range of events at Scottish Castles and gatherings such as Highland Games for the entertainment of the public. The groups are open to new members who want to demonstrate their acting skills. The groups below have members who play roles ranging from Vikings, Knights, Lords, Ladies, Foot Soldiers, Cooks, Archers, Pedlars, Beggars, Jesters, Musicians, Jugglers, Armourers, etc. As well as performing key scenes in history the groups demonstrate historic day to day living such as cooking, feasts, dancing, medical care, swordsmanship, horsemanship, calligraphy, falconry, courtesy and chivalry - all with authentic dress. 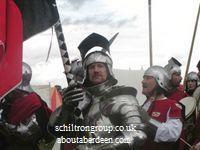 Schiltron, Aberdeen's premier mediaeval re-enactment group, has been operating since 2004, and during that time has performed in many venues portraying Scottish life of the mediaeval era. The group covers the late 13th and early 14th Century period of William Wallace and Robert the Bruce, and also the 15th Century, when plate armour was at its peak. Members depict the domestic, commercial and military sides of life of those times at public events and re-enactments, and in the off-season meet together to learn mediaeval skills, such as: longbow, crossbow, spear work, swordsmanship, horse-riding, designing and preparing new costumes, music, wool spinning and, of course, attending feasts. Participants develop their own adopted mediaeval personas, and construct a name and background for their alter ego, which fits in with the assumed history of the group as a whole. A vast range of roles are available, ranging from the higher echelons of society of the knight and his lady, to the lesser mortals such as the barber surgeon or seller of relics: the opportunities to portray life of the era are boundless. 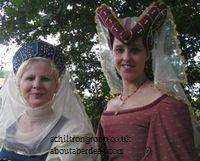 Over the last few years, Schiltron mediaeval re-enactment group has appeared at various locations in Scotland: Castles Fraser and Drum in Aberdeenshire, Traquair House and House of the Binns near Edinburgh, Bannockburn, Arbroath, Crieff and Lanark, as well as at several locations in Aberdeen itself. Outside Scotland, members have participated at the Battles of Tewkesbury and Bosworth in England, and attended La Fete des Ramparts in Brittany, France. 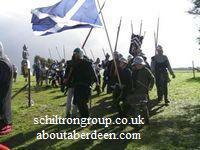 Marr Agus Fibh is a re-enactment group based in Aberdeenshire. They concentrate on the period 950-1070, the age of the Vikings and, especially relevant in Aberdeenshire, Macbeth (who has strong links to Glamis Castle). Their members engage in battle re-enactments as well as a living history display and encampment. More outdoor activites in Aberdeen.